IDIL Fibres Optiques has collaborated with IFSTTAR in order to integrate optical fiber sensors (FBGs) into concrete within the framework of civil engineering applications. 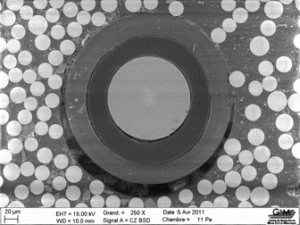 IDIL has developped 176 Fiber Bragg Gratings (FBGs) sensors photo-imprinted on 24 connectorized optical fibers. Those optical fibers were designed to withstand alkaline metal while resins with a special reticulation process were used. Consequently, the manufactured cable is flexible enough to be packaged in strand and to follow the geometry of the structure that must be monitored. This particulat shape enables to ensure a continuous and efficient fixation into concrete. 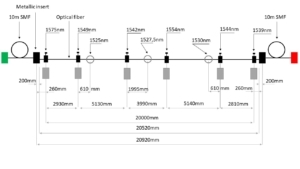 Otherwise, this specific coating which consists of a semi-stiff cable allows a perfect information transfer from the concrete as far as the optical fiber without any change in the deformation field. Metallic jacket diameter 4.6 mm. The length must be specified. 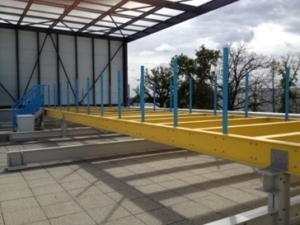 The DECID2 project involved the construction of a Platform of large dimensions made entirely of smart composites. Two demonstrators were manufactured and installed. The target is to experiment and model their performances under mechanical and environmental aging.